Applying nail polish can be a challenge for some people, especially applying dark, deep colors. First you need to take your time, rather than polish the whole nail in one full swoop. Break the process into at least three strokes: First, paint the center, then swipe along each side on the nail, keeps the coats thin to prevent chipping. Also ladies you have to stay in the lines. But if you happen to go outside the lines use an orange wood stick or a Q-tip to clean it up. For a finish professional look, always leave a small open space between the cuticle and the polish line. 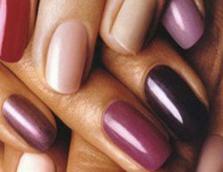 (Quick tip) Before removing polish brush cuticle oil on each nail, to avoid staining the base of the nail on the fingers. The purpose of the oil it creates a barrier that keeps the color from penetrating the skin as you rub it away.